Solved: The mystery of unexplained 'bright nights' | Watts Up With That? 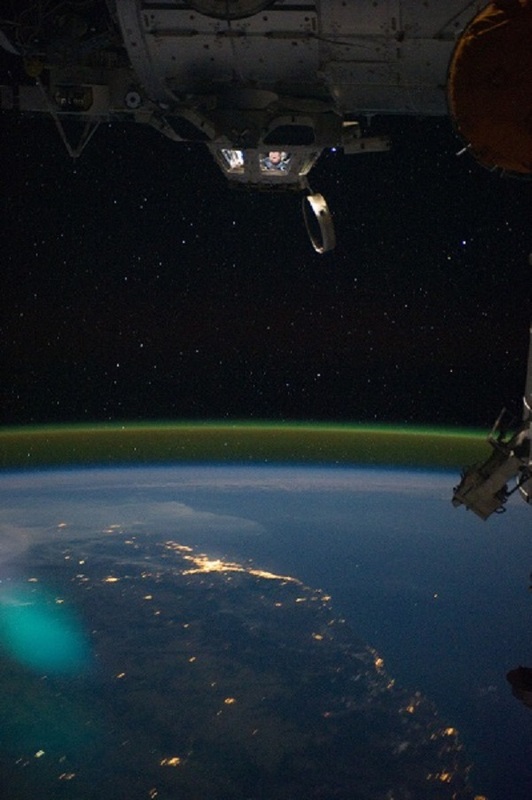 The different layers of Earth’s airglow can be seen from the International Space Station as it orbits Earth. 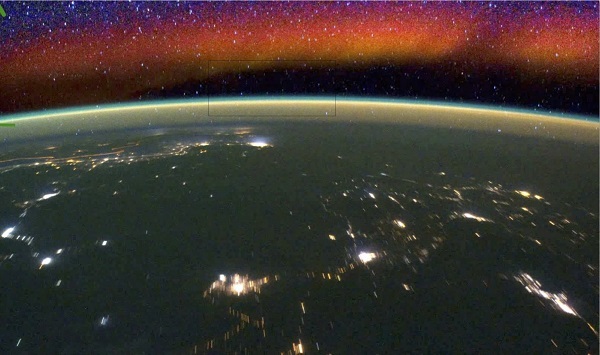 The very thin green layer above the bottom of the window occurs 95 kilometers (59 miles) above Earth’s surface; the red region above is a different type of airglow. The rectangle represents the portion of the airglow measured in a single WINDII image. European newspapers and the scientific literature also carried observations of these events in 1783, 1908 and 1916. “The historical record is so coherent, going back over centuries, the descriptions are very similar,” Shepherd said. Shepherd knew of the historical observations and could see bright night events reflected in airglow data from the Wind Imaging Interferometer (WINDII), an instrument once carried by NASA’s Upper Atmosphere Research Satellite (1991-2005), but he couldn’t explain why the phenomena occurred. He and his co-author, Youngmin Cho, a research associate at York University, searched for mechanisms that would cause airglow to increase to visible levels at specific locations. Airglow comes from emissions of different colors of light from chemical reactions in the upper reaches of the atmosphere. The green portion of airglow occurs when light from the sun splits apart molecular oxygen into individual oxygen atoms. When the atoms recombine, they give off the excess energy as photons in the green part of the visible light spectrum, giving the sky a greenish tinge. If an astronomer wanted to experience a bright night personally, Shepherd suspects that scientists could predict their occurrence if they monitored the waves continuously, so that they could calculate when their peaks would align. The next challenge will be to reproduce the observed convergence of these waves through modeling and to consider the effects of other types of waves in the atmosphere, Scheer said. June 22, 2017 in Optical phenonmena. Should such glow events not be easily spotted in the satellite record? “Bright nights have disappeared,” Shepherd said. Well if you only get one or two in a century and half he’s a bit quick to say they have “disappeared”. Lamentable what constitutes observational science these days. Did you actually READ the entire article? Those dates are of literature mentioning the events, not the only dates they occurred. That’s 25-26 times per year. A testable hypothesis, the hallmark of good science. It also seems to me that it is an excellent opportunity to use citizen scientists in remote locations testing the predictions of the researchers. It would save the considerable expense of sending in researchers. An observer is not a scientist. The science comes from interpreting the observational evidence and formulating a working hypothesis. The observer is a lab tech. You don’t have to be a scientist to observe something. Interpreting the evidence, formulating a hypothesis, and predicting when and where an event will occur=science. Having someone at that location on that date verify that “Yep, there’s a bright sky tonight” is a good idea, and scientists use non-scientists to make observations all the time. First-most lab techs have degrees in science. Second-I’m observing you make repeated and completely illogical and unintelligent comments here and I’m not a lab tech. How long does it last? Could a light meter be set up to alert a human when the reading surges? Based on their ability to predict when the peaks will align, and where the brightness should be visible, it should be possible to set up light meters prior to and watch the readings surge and then return to normal. Ceilometers are fairly common at airports, even remote ones. I wonder if there’s a way to mine ceilometer data to catch the bright night phenomena. The battle was during the daytime, so no, a bright night doesn’t explain that impossible passage. I didn’t spot the place where they blamed the absence of bright-nights on cagw, it must’ve been in the request for further funding. It’s all down to glow-ball warming. I bet North Korea still has bright nights. Nobody was reading their newspaper or checking their watch by night in the first century. But, still interesting. No, …But they *were* trying to get home in the middle of ancient cities that had no street lamps or other sources of light, and could be pitch black at night. Waiting for torch bearers could be a pain, and people would *notice* when the night was bright enough they did not need Moonlight, or torchlight to get home after leaving some friend’s party! Fantastic picture of the space station. Look at that thin little envelope that protects us. This is a description of constructive interference patterns and harmonics. This would confirm something I have been cogitating for a while. 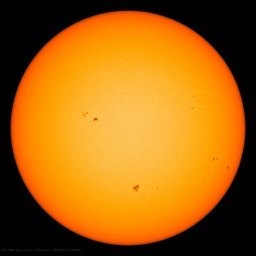 Q: How do you explain the fluctuations of climate and weather if the energy input from the sun is ‘constant’? A: The system dynamics migrate back and forth from dissonance and chaos into harmonic resonance and interference patterns. There are areas/periods of constructive interference that amplify the energy levels on a local level, and areas/periods of destructive interference that cancel energy levels. The net energy in the system remains constant yet the effect is peaks and valleys of harmonic resonance in the system. This is expressed as high and low pressure systems, jet stream meanderings, ENSO and all the features of this crazy chaotic system. Reading newspapers by airglow so dim that light pollution overwhelms it everywhere in the world except the most remote places? I doubt it. I can believe reading large newspaper headlines by that though. Human night vision does not have the resolution needed to read the print in newspapers under the headlines. Apparently historical events were a lot brighter, if accounts are accurate. However, they are centennial events. That explains the recent lack. QBO has a period of about 2.4y and they looked at 2y of data. Historical records relate strong events every century or so… and they look at 2y of data. Fine. I suppose it’s a start. Seriously, do you have a reading comprehension problem Greg? if you do, I apologize for being blunt. SO….if these events were “centennial events”, as you mistakenly state they are, then 11 events within a two year period does not indicate a “recent lack” but an enormous and sudden ABUNDANCE of events. BUT…you fail to realize that you are not reading the article correctly, because it never states that these events ONLY happen every 100 years. It says they happen on at least 7% of earth nights! That we can no longer SEE them easily due to light pollution, does not mean they are not happening, or that there is a recent lack OF them. Because there was not “light pollution” in 113 BCE or 1783 or the “many other times” (stated in the article) they were easier to see AND got way more attention than they do now. You are making a personal ASSUMPTION that the “historical records relate strong events every century or so” that is not backed up by the article in any way. So….oxygen atoms…split by the SUN…emit ENERGY when they recombine….and sometimes there is so much of this ENERGY in one place at the same time that it can actually become visible to the naked eye. Can we logically assume then, that it happens constantly, but 93% of nights it’s just not concentrated enough to be visible? I ask because oxygen currently makes up 20% (ish) of our atmosphere. Has the amount of “oxygen combination energy” ever been measured? Calculated? How much energy is produced? Does it affect climate? Do atmospheric models address it? … and do similar phenomena also affect stratospheric cloud cover, for example? obvious pseudo : cf. Ho Chi Ming. large waves in the upper atmosphere that circle the globe and are impacted by weather. AlGorian cause and effect myopia. More like the waves affecting weather. But don’t want to give the impression that natural phenomena could affect weather and ( God forbid ) climate, do we? Great post. I love this site, as I love science in general (being a real scientist). In fact, about 98% of Earth is NOT light-polluted. Lit urban areas are that little compared to the world the rest of us live in. I have noticed bright nights lately, here in the mountains at 2000′. It gets dark up here at night when the Moon is down. I have noticed that when looking out the window at times in the middle of the night. Every once and awhile there is enough light to where I can readily make out the surrounding view from my window, and to see animals such as deer, bear, etc. Modelers? Atmospheric scientists? Climate scientists? Anyone? Bueller? How much energy is discharged when oxygen atoms recombine in the atmosphere? And has that energy been measured AND addressed in climate science?? Yes it is called bond energy. There are tables available it has been calculated and measured. Thanks Owen. Because it can actually produce ‘visible light’ in high enough amounts, is it short wave energy or long wave? Do climate models account for it? As Owen indicates, the process is well understood & quantified. The energy needed to split O2 certainly does “warm” the atoms themselves, however recombination emits that same energy as visible light in a very narrow green band (typically), and the amount emitted is so faint that while our eyes typically perceive the darkness between the stars (on nights when they’re visible) to be slightly less dark than the shadows of mountains or trees, it is nevertheless perceived as a dark shade of gray or indigo (not green) since there’s just not enough energy to activate the green cones in our eyes. The green light recombination emits isn’t really categorized as “short/long-wave” either; it’s just visible light. Also, that particular emission band (~558 nm, which isn’t the ONLY band that produces airglow, but it is by far the main one) tends to either reflect or pass through just about everything between the ground & the TOA, so I can’t imagine that airglow contributes any significant energy to the climate system from the jump, let alone that the difference between airglow emission on “bright nights” vs. regular ones should be significant. Thanks for the link Smokey. I’ll read it this afternoon. Hmmm…Al Gore used to be all hyper about the “Ozone Hole”. Now he’s all hyper about CO2 from fossil fuels and “Global Warming”. Al Gore is a failed (but a profiteering) politician. Might such as he be the connection to “climate science”? There are still plenty of people who work and live in remote areas who would still see this phenomenon if it were present regularly…. Strange that you don’t hear much about it? As a trawlerman I never observed “bright nights” as described here…. But on really cold nights in Tropical Queensland… about 15 degrees lattitude, I did observe an atmospheric magnification effect of stars in the night sky. It was a very clear and cold night (for the tropics) about 12 degrees, and the wind was ESE, blowing at about 25 to 30 knots. The atmosphere was clear. We decided to have the night off, because it was too rough and we didn’t feel like bashing around for the low catch rate we would be expecting at that time of year. Anyway at about nine o’clock at night, the anchor started dragging and wouldn’t dig back in so we started the main engine went on deck and winched it up and moved back to the anchorage… While up on the bow doing this I noticed that the stars above were unusually “bright” and some groups were quite large and I didn’t really recognize them, not that I’m much for identifying many star constellations. But I took note of a group of stars in a cockeyed square/trapezoid shape as we steamed back into the anchorage, after we’d finished I look back up….. and the Stars were “Gone”. Well three were sort of there, but smaller and duller…. So I went into the wheelhouse and retrieved a set of binoculars and scanned the area of the sky where I’d seen the four stars….. Under magnification, all four were back again. All I could put it down to, was that the Cold air layer was shaped in such a way for a short while, that it magnified that part of the sky from my position of observation through it…..
I’ve only seen, or noticed this effect twice in all my years fishing and being in remote areas. I’ve had plenty of cold nights were the stars seemed brighter and larger, but only twice have they been so outlandishly and obviously so. Cockeyed constellation sounds like Ursa Major…Big Dipper. What does that do to the blackbody temperature of the sky? Gases are not considered blackbodies. My comment was not in regard to gases. The sky is, in fact, considered to have a blackbody temperature. A search on ‘”blackbody temperature of the sky”‘ yields 33,700 hits. It’s commonly taken as approx. 3 or 4K. Under the conditions discussed here, it may (or may not) deviate from that significantly, with a consequent effect on radiation transmission to space. What do you want to bet that it appears in climate models as a constant?